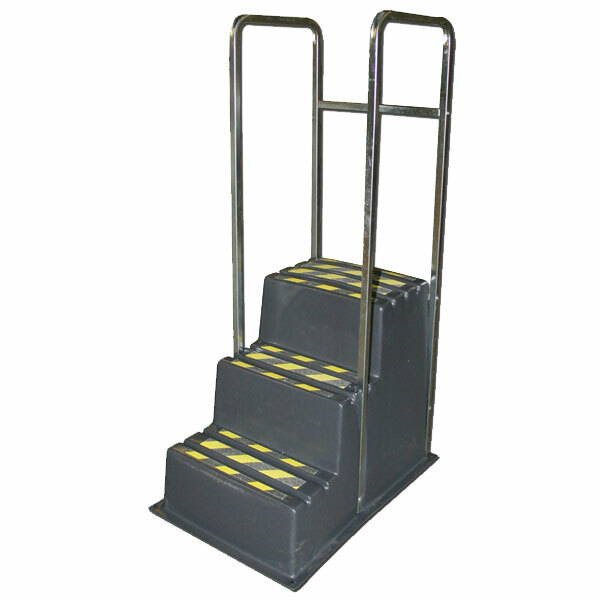 The SS Series SS3-HR Three-Step Safety Step Stand with Handrail is a safety step stand with grit tape, recessed channels for liquids, nestable, resistant to corrosives, easy to care for, long-lasting, heavy-duty, high-capacity, handrails. OSHA compliant. The overall height of the SS3-HR with the handrails is 64". Also referred to as plastic step stands, step stools or load stands. Three-step w/ handrail model. Outer Dimensions (OD) (LxWxH) 26 x 37 x 29"
Overall height with the handrails is 64"
Handrails ship assembled, unless otherwise requested.